Be it a baseball through the glass, mold, termites or any natural disaster, sometimes you may find yourself in need of learning How to Replace a Window. Contrary to what you might think, you can easily learn How to Replace a Window and do it yourself with just a little time and the proper tools. Today we’ll show you how! 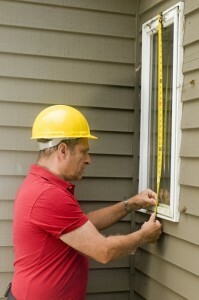 Measure the height of existing window. To measure the height of the existing window, go from the top of the sill to the bottom of the head jamb. Measure the width of existing window. To measure the width of the existing window, go from the jamb on left side of the window to the jamb on the right side of the window. Again, measure across at the top, middle, and bottom, selecting the shortest distance as your true measurement. Finally, check the squareness by measuring diagonally across the window at both sides. Take a measuring tape and measure from the top left of the frame to the bottom right of the frame, and the from the top right of the frame to the bottom left of the frame. If there’s a difference of less than 1/4 inch (0.635 cm) in the diagonal lengths of your frame, you can make small adjustments with shims when you install the new windows. If the difference between the two numbers is larger than 1/4 inch, you should consider replacing the entire window frame. Know that if you buy a window that fits the existing window frame, you won’t have to buy a whole new window frame. This is why you measure the existing window before you remove it. Remove the inside stop pieces from the right and left sides of the window. If you can, remove them without damaging them, as you’ll reattach them once you’ve installed the new window. If you happen to damage the inside stop pieces while removing them from the window, take a bit of wood filler and mold it onto the damaged part of the stop. Once it’s dried, sand it and the surrounding wood down. Consider giving the stop a new coat of paint before reattaching to the frame. Take out the inside sash from the window frame. Once the inside stops are gone, this should be a fairly easy procedure. If, however, the inside sash is connected to a weight by a chain, simply cut the connecting chain or chord and let the weight fall down to its well. Slide the outside sash down to the bottom portion of the frame. Remove the parting bead and throw it away. Then, remove the outside sash in the same way that you removed the inside sash, slashing any chains or chords that connect it to a weight. Thank you for reading! We shall continue with the second part on this series on How to Replace a Window in our next segment, be sure not to miss it. Share this with family and friends and we hope you have a nice day! Goodbye!